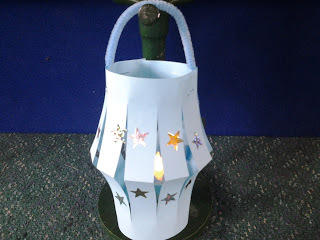 Lanterns and lamps appear in many Bible stories and they’re so easy to make, but I’ve always been disappointed that it’s difficult to put a light in a lantern without risking the whole thing going up in flames! 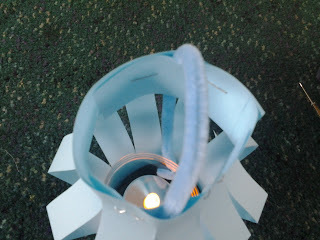 It seems such a shame to make a craft about light and then not to give the children a light to put in it! Here’s a solution. Depending on the age of the children, you might want to assemble some parts beforehand. 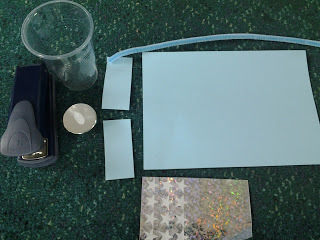 You will need: a clear plastic cup, a battery-operated tealight, an 8.5 x 11 inch sheet of colored paper, 2 small strips of the same color paper, a pipe cleaner (preferably the same color as the paper, stickers or other decorations, a stapler, a one-hole punch, and scissors. Fold the paper in half lengthways. 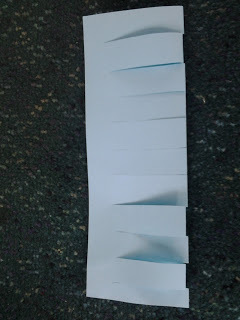 Cut a series of slits through the fold, but make sure you leave a space between the end of the slit and the edge of the paper. Cut off the top part of the plastic cup and discard it. 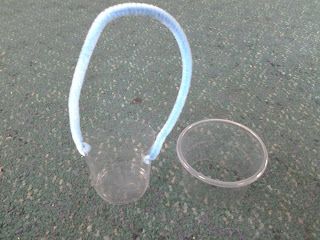 Put small holes in the sides of the remaining plastic cup and secure a pipe cleaner to it as a handle. 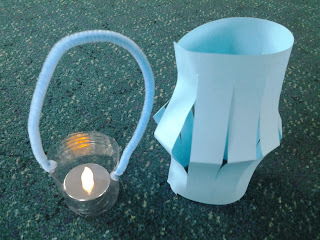 Open up the paper and glue the two edges together so that the lantern looks like the one below, with the original fold line running across the middle. 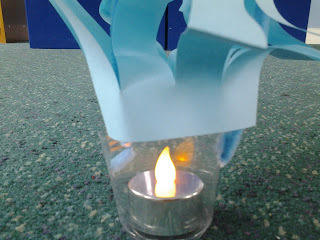 Lower the plastic cup and tealight through the top of the lantern. Secure the handle by stapling the small strips on the top inside lip of the lantern, making sure the pipe cleaner is in between the lantern and the strips. Staple the strips on either side of the pipe cleaner but not over the pipe cleaner. The pipe cleaner should be able to move freely through the strips so you can adjust the height of the light. You will be able to pull up the lantern so you can reach the tea light to switch it on and off. Simply put the lantern back over the top when you have finished. Now decorate your lantern! The lantern will hang easily and the light will shine! This is a great craft to use for teaching about Jesus being the light of the world and him wanting us to be like light to others. Because the light is safe, children can use it at home to remind them that Jesus is with them and as a reminder that they can bring light to others.